Forza 5's creative director says that even devs that can't hit the 1080p/60 FPS benchmark are still using "100% of the box". 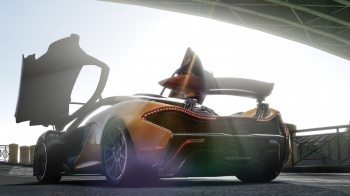 Forza 5, one of the Xbox One's launch titles, will run at 1080p/60 FPS, "Even in an F1 car, going 220mph around Spa with 16 other F1 cars on the track." Other games, such as Ryse: Son of Rome and Dead Rising 3, will not hit that benchmark, running at 900p and 720p respectively. Many may have attributed this to the developers not utilizing all of the power the Xbox One has available, but Forza 5's creative director, Dan Greenawalt, says this simply isn't the case. He says that "everyone" is using "100 per cent of the box." "But the truth is that I get asked are we using 100 per cent of the box? Of course we are. Everyone is. Even people who are upscaling are still using 100 per cent of the box." He says that the trick is not in simply using more of the console's power, but learning to optimize. "What happens over the course of years is that we get better at tricking the box into doing what we want. It's optimization," he told Xbox One magazine. He added that, in the case of Forza 5, "We had more time so we're very well optimized and we will continue to optimize this game. If you think about Forza 2, it was a well optimized game, but Forza 4 looked a lot better than Forza 2. That just comes with time." He said that his team started working on Forza 5 before Forza 4 had even shipped. "And to me, I've been working on Forza for ten years now and the reason I like it is that Forza's always a challenge, we push innovation and it's not always just make it shinier. It's cloud powered AI, 16-player multiplayer, dedicated servers, curated liveries. There's just a lot of innovation there."